Elaine Retholtz has been studying and practicing the Dharma since 1988. In addition to teaching Dharma at New York Insight, she is a certified Mindfulness Based Stress Reduction teacher and has a deep interest in helping students integrate mindfulness practice into daily life. Elaine is committed to deepening her own understanding of issues of diversity and the way racial conditioning in the United States affects all of us — both as individuals and in relationship to the institutions we are a part of, including New York Insight. 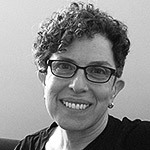 She’s been involved in New York Insight’s diversity efforts for many years, serving on the diversity committee, and working with others to create spaces – for diverse groups of practitioners as well as for white practitioners meeting separately – to explore these issues within a Dharma frame. In addition to her teaching, Elaine works as an acupuncturist in private practice, integrating mindfulness into her encounters with clients.